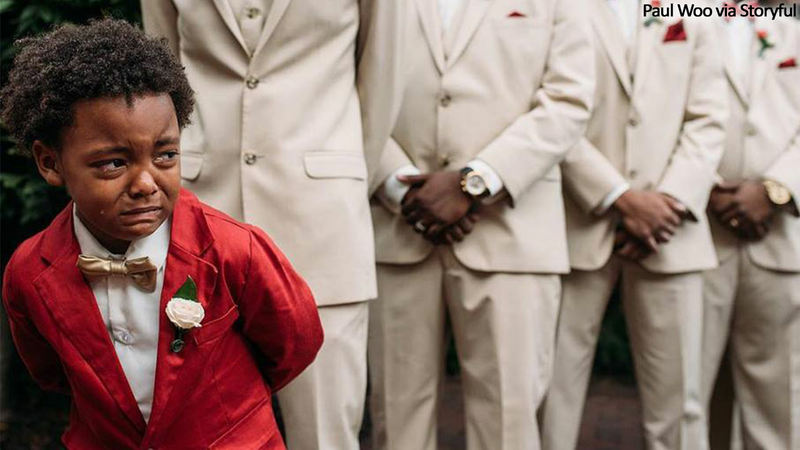 A viral photo shows a young boy with tears streaming down his face as he sees his mother walking down the aisle on her wedding day. A photo of then six-year-old Bryson Suber has recently been shared thousands of times. The image won the runner-up spot for the 2017 International Wedding Photography of the Year award, which has brought unexpected attention to the 2016 picture. Photographer Paul Woo, who captured the moment, posted the photo to his Instagram account with the caption, "When he sees his mother down the aisle the first time." The boy's mother stated, in part, "I hadn't yet realized that my sweet, soulful oldest baby boy was also sharing in on this moment so deeply, with us. Taking in every breath, right along with us! To see him share such strong emotions of joy and happiness for the union of his parents was seriously one of the most powerful moments I've experienced to date!"